Femke, a gifted and resourceful young spy, is entrusted with a vital foreign mission by the Emperor. Her adversary, Shalidar, frames Femke with responsibility for two murders while she is visiting their neighbouring court. Femke is isolated in an alien country, being pursued both by her enemies and by the authorities. Only her side-kick, Reynik, a young military trainee, can help. Together, they must outwit the evil assassin Shalidar and prove Femke’s innocence so they can complete the imperial mission. This is the first book in the Imperial series. Mark Robson’s latest book plunges his readers immediately into the action and rarely lets up … Into a fast-paced and suspenseful plot, Robson manages to mix in espionage, assassinations, politics, enough peril and adventure to overwhelm a less dauntless heroine, and even a little romance. 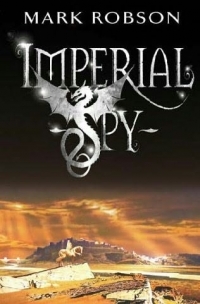 Fans of his previous books will find that he meets and exceeds all of their expectations, but with IMPERIAL SPY he is sure to gain many new and enthusiastic readers as well. Imperial Spy makes entertaining reading for fans of derring-do; it is packed with precisely rendered descriptions of surveillance techniques, military tactics, armed and hand-to-hand combat and the politics of conflict.